I decided to take a deep dive into TSM accounting to look at how the last week has gone for me. What groups have been profitable and what I have been buying. Next I’m gonna break it down, first on an item basis and then in terms of groups. In the item tab in accounting you get a summary of the items you have bought or sold. 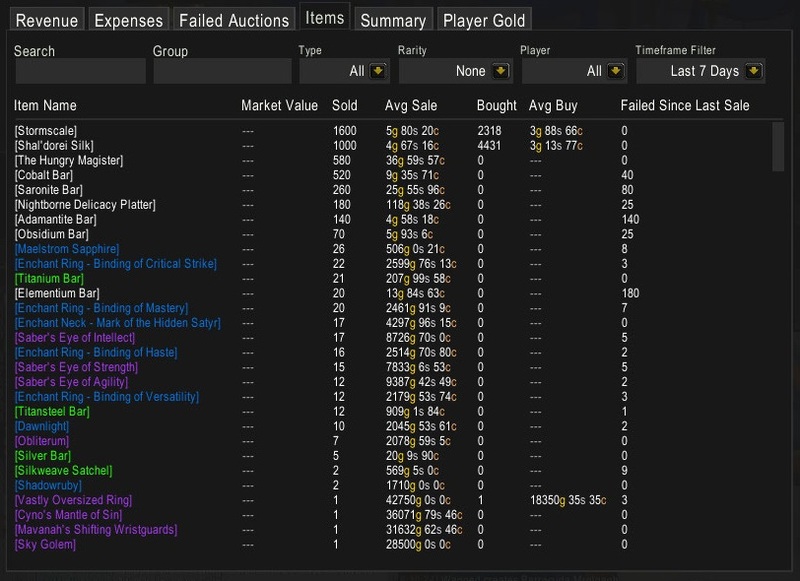 I have added screenshots of the items sorted by quantity for buying and selling. My biggest sales in quantity are Legion materials that i flip followed by buff food and bars. Then my main markets from a total gold perspective follows. Enchants and epic gems sell very well and make a large portion of my sales. Looking at the list my biggest takeaway is that the number of items I sell a lot of is too small. I feel like i need more items i can craft that sell regularily. One-off flips showing up in my top sellers doesn’t feel great. So I will definitely look to increase my total stock. My purchases are impacted heavily by the fact that i got my druid to 110 and I know have Rank 3 Warhide bindings. I have been buying tons of Leather to turn into enchanting materials. We also see a large amount of unsold BoE stock. Outside of that my buys support my enchanting and epic gem crafting. 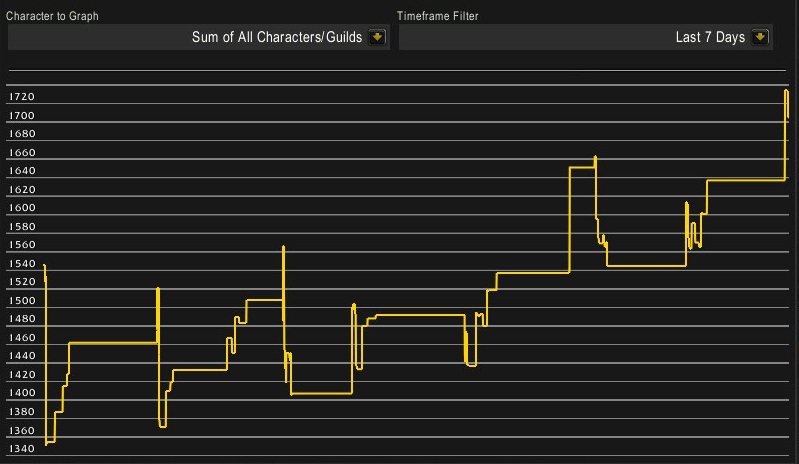 We see that my profits from jewelcrafting are about 137 000 gold the last week. When we break down the group based on items we see that the majority of profits come from the epic gems. I have sold a total of 35 epic gems. 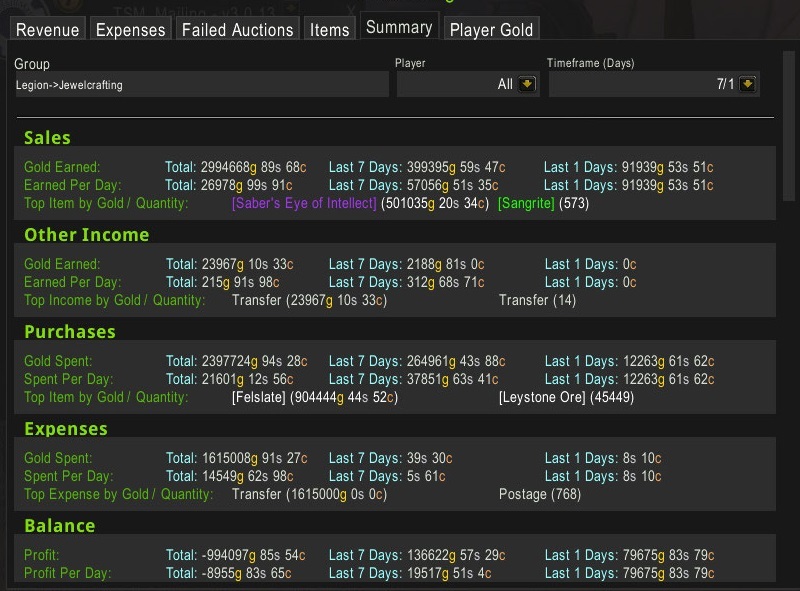 We see that 80 000 of my 137 000 gold profit came the last day, which is raid reset day. 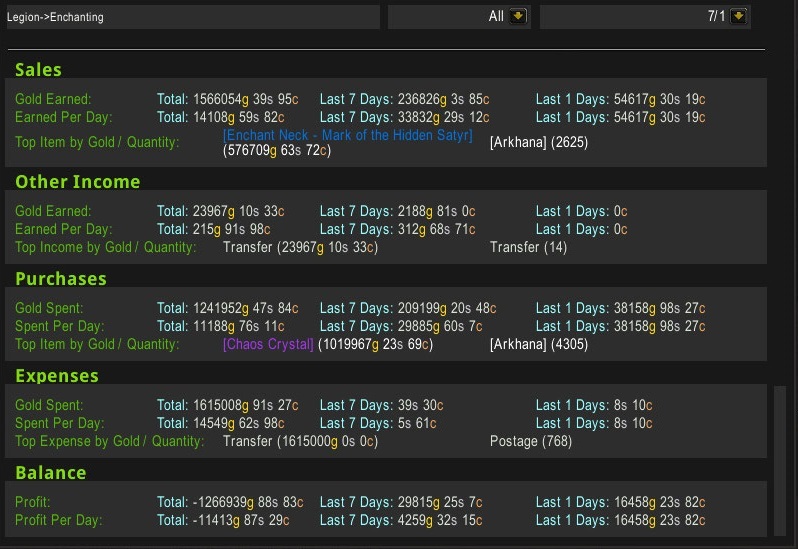 Selling Gems on reset day is a large portion of your sales, and being online and posting during and after raids is important. We see I have also sold of some gems from prospecting, but I have done very little prospecting this week. Most of the uncut gems i sold are left overs. 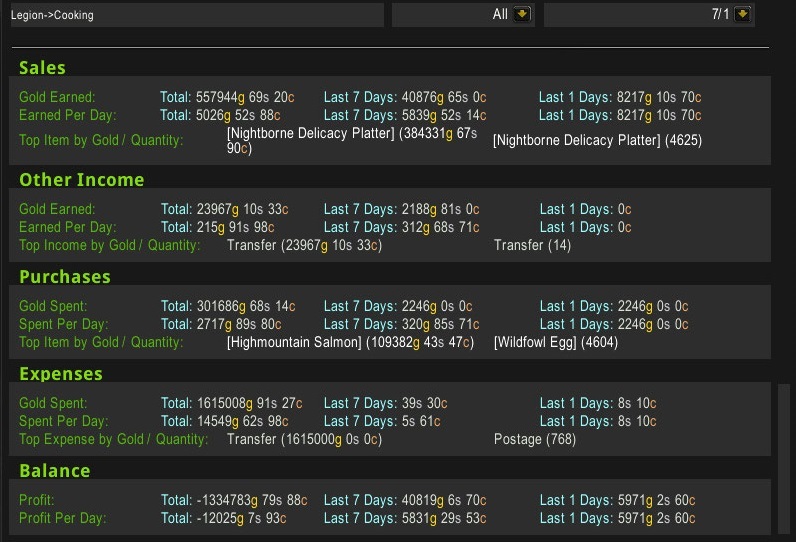 I only made about 30 000 gold from enchanting this week. This does however include purchases that I have not turned into enchants. 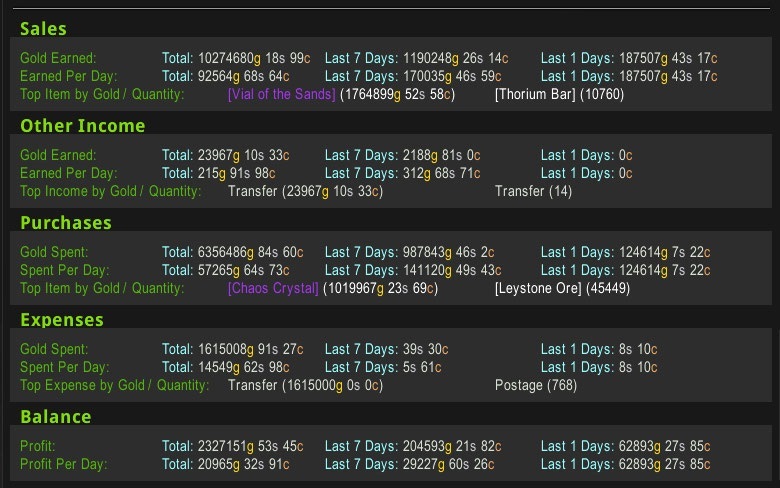 I have a large stock of Chaos Crystals (50-60 000 worth of them). I have also turned some enchants into Obliterum (This is very profitable) and so this does underreport my income to some degree. I will definetly be looking at buying and crafting at a fast pace the next week to build up a large amount of stock. 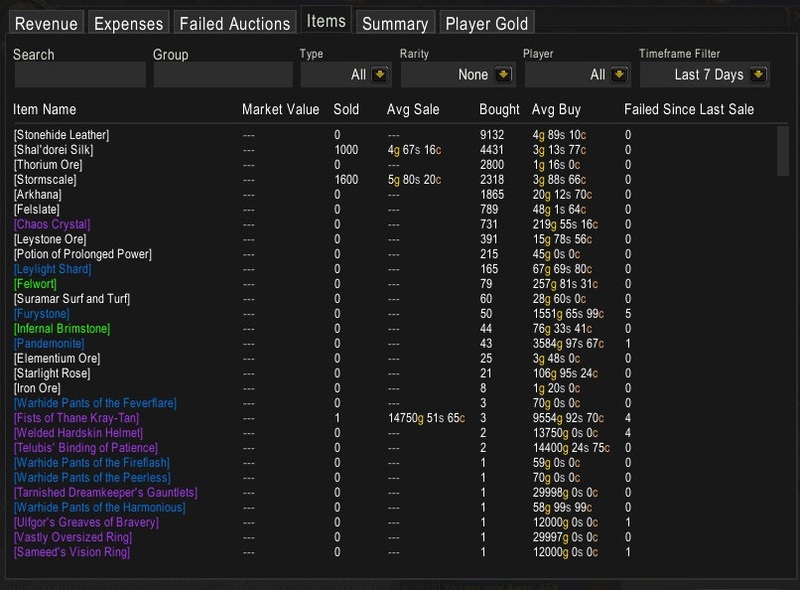 I have usually never crept above 10 of each enchant I sell. Cooking has continued to be nice. I recently got the rank 3 recipe for Azsari salad so I will be adding this to my cooking format. I mostly sell Nightborne Delicacy Platter and The Hungry Magister at the moment to fairly good results. We see I have made 41k the last week, but it is slightly misleading as I have not been buying materials, just selling of stock. 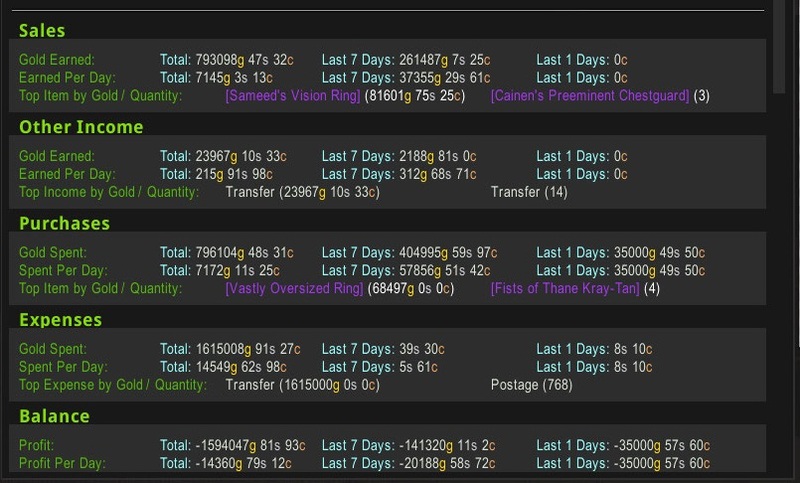 In addition to this I have some smaller income streams from selling bars and some small amount of Transmog (about 30k total the last week) and I have sold 1 VIal of The Sands for 57 000 gold. (I have 3 more in Stocks and materials for 2 more sans some volatiles for Truegold). I will probably take a new look at my sales in two weeks time. My main goal for the next 14 days is to increase the number of crafted items I sell on a regular basis. I feel that my crafting is currently to concentrated. Hopefully this insight into what I’m making money on will be useful to you. Stay tuned for my leatherworking spreadsheet that will be coming this weekend!